Providing you the best range of slogan imitation pendants and train beyond pain slogan pendants with effective & timely delivery. We are one of the reliable organizations in this domain and are into presenting an extensive quality range of Slogan Imitation Pendants. 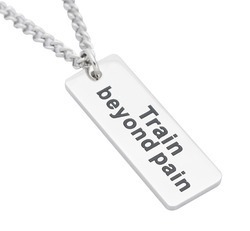 Being a customer oriented firm, we provide an enormous assortment of Train Beyond Pain Slogan Pendants to the clients.